For many years, I have been a huge fan of Weight Watcher’s recipes. I love them for their healthy and colorful ingredients, and ease of preparation. This Huevos Rancheros in Tortilla Cups recipe, is no exception as it has a lot of flavor, beautiful colors, and is very easy to make. This tasty Huevos Rancheros in Tortilla Cups recipe, comments, and photos were shared with me by Karen Calanchini, Food Stylist and Photographer, of Redding, CA. The original recipe has been adapted from Weight Watchers’ Greatest Hits cookbook. * You may use purchased corn tortillas. Learn How To Make Corn Tortillas. ** Hatch Chiles are available during the latter part of August to early September. Learn how to prepare, roast, and freeze Hatch Chile Peppers. How To Make Tortilla Cups: Lightly spray both sides of the corn tortillas with non-stick spray. Place the sprayed corn tortillas into a Tortilla Bowl Makers or oven-safe bowls (that will hold the tortillas - like inverted custard cups). Bake in preheated oven for approximately 10 minutes or until the tortilla are crisp and the edges are lightly golden. Remove the tortillas and set them on a rack to cool. You can make the tortilla cups up to 2 days ahead of time. Just store them in a zip-close freezer bag at room temperature. Re-crisp them in a 425 degree F. oven for 2 minutes before using. If you prefer a soft tortilla, simply stack the tortillas, wrap them in aluminum foil, and warm in a 350 degree F. oven until heated through. Huevos Ranchero Sauce: In an oven-proof skillet over medium heat, combine the diced tomatoes, beans, Hatch chile peppers, pepper sauce, and cumin. Bring just to a boil, then reduce heat to low and let simmer until the flavors are blended, approximately 5 minutes. 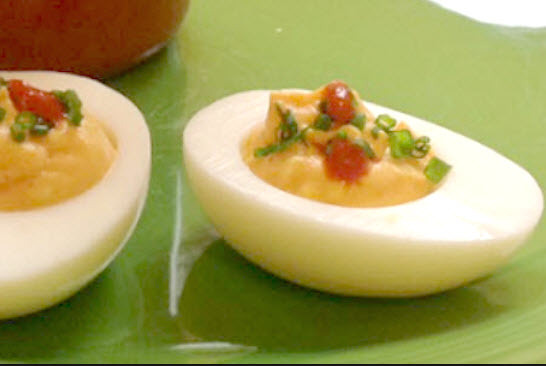 Break the eggs, one at a time, on top of the prepared Huevos Ranchero Sauce (spacing them evenly apart). Immediately place the pan in the preheated oven and bake until the eggs are almost set, approximately 6 to 8 minutes. Sprinkle the cheese over the top around the eggs. Bake until the cheese is melted and the eggs are set. Place the prepared tortilla cups on serving plates. Spoon some of the sauce into each tortilla cup. Then lift an egg and some sauce out of the baking dish and place in a tortilla cup. Repeat with remaining ingredients and tortilla cups. Garnish with cilantro and serve immediately.